Links to your pages are displayed in your header area of your blog (your main navigation area) or are displayed by adding a Pages widget or custom menu widget in your sidebar. Most of our themes support custom menus which means you can customize your navigation menu and add navigation to the header area of your theme. 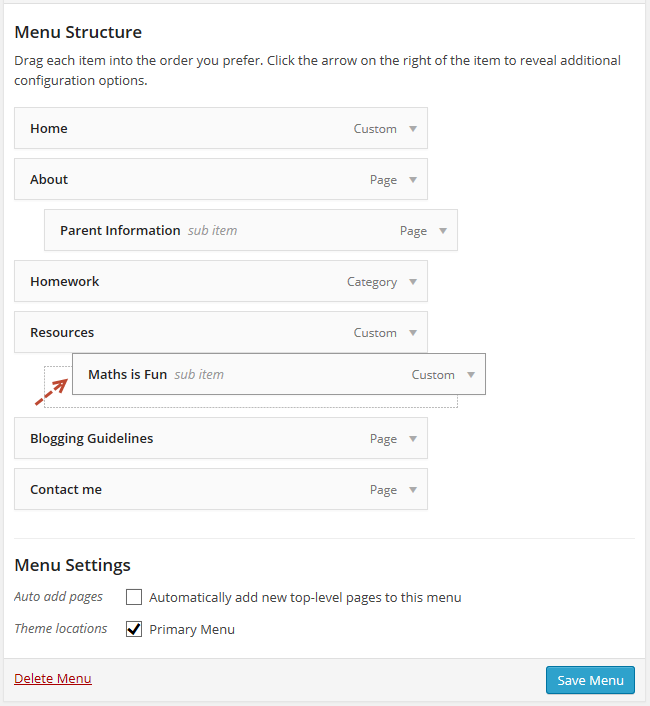 Custom menus can be set to “auto add pages’ so that new pages are automatically added to your menu when the page is published or you can manually add the new page after you’ve published the page. Adding a new page is as simple as go to Appearance > Menu, check the boxes next to the pages you want to add, click Add to Menu, drag and drop the page item when you want it to appear in the menu and then click Save Menu. Links allows you to add a link to another website or a specific post on your blog. To add a custom link you type the URL where you want to take someone when they click on it, add Link Text to specify what the tab will say, and then click Add to Menu. Now just drag and drop the link item when you want it to appear in the menu and then click Save Menu. Category pages allow you to send posts to different pages on your blog. This is handy if you want to use one blog for multiple classes or subjects. Students will see a link for their class in the top menu navigation of your blog, and once they click on that link, they will see only posts meant for them, with the most recent at the top. Check out how category pages work on our demo blog. When you click on the Geography link in the top navigation you see all posts published for the Geography class. To add category pages you select the box of the categories you’d like to add and click Add to Menu. Now just drag and drop the category item when you want it to appear in the menu and then click Save Menu. 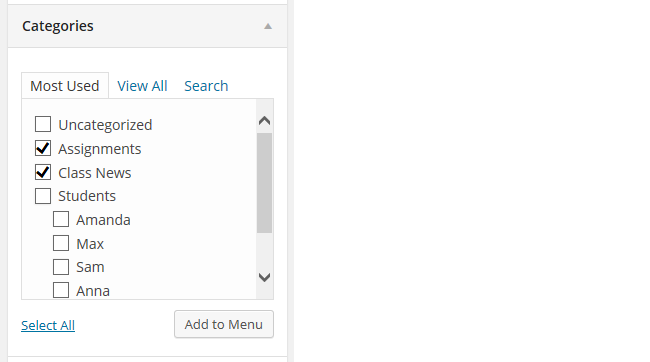 Refer to sending posts to different pages to learn more about using categories with custom menus. You can change the order and placement of menu items at any time by drag and dropping the items. 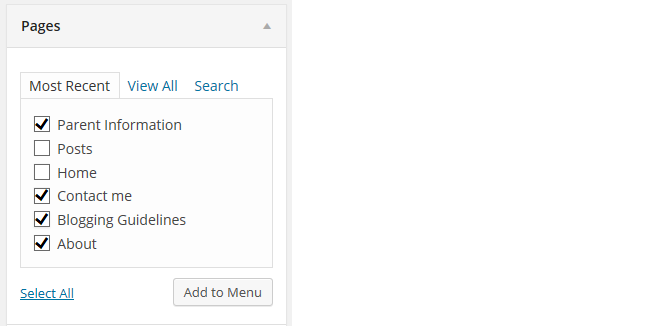 Here’s what my custom menu looks like in the main navigation area of my blog header. Remember whenever you make changes to your custom menu to click Save Menu. You can customize the text and other details of any item you add to your menu. To edit a menu item you click on the down arrow to the right of the menu item. Navigation Label – used to over ride the default name of the menu item and replaces it with your own navigation label. Title attributes – adds custom hover text to improve usability for impaired visitors using assisted devices. Remove – lets you delete an item from the custom menu. Cancel – allows you to cancel any changes you made to a menu item. Remember to click the Save Menu button whenever you make changes to your custom menu. You can also enable advanced menu properties in screen options. All you need to do is click on Screen Options at the top of the page and select the items you want to show on screen. The most common advanced menu property you would use is Link Target. Link Target is used to control if your menu links open in a new tab (or window) or the same window when a link is clicked. By default, links open in the same window. Links to pages can be displayed in your sidebar using the pages widget or a custom menu widget (Appearance > Widget). You can change the order of pages displayed by the custom menu widget by editing the order of pages in your custom menu. Say for example you have four pages: About, Blogging Rules, Contact Me, Help and you wanted to change their order from alphabetical to About, Blogging Rules, Help, Contact Me. 1. Go to Appearance > Menus to create a custom menu or edit your existing custom menu. 2. Now drag/drop the menu items to change their order in your menu. 3. Once you’ve finished changing the order click on Save Menu. 4. Go to Appearance > Widgets. 4. Add the Custom menu widget to your sidebar. 5. Select the custom menu you want to display and click Save. Links to pages can be displayed in your sidebar using the pages widget or a custom menu widget. You can change the order of pages displayed by your page widget by changing the order of your pages and using the Page order option on the pages widget. 2. Hover your mouse over a page title to bring up the action menus and then click on Quick Edit. 3. In the order field change the number to the new order you want the page to appear and click the Update. You repeat this process for all the pages, and numbering them from 1, 2, 3, 4 and so on for the Order field. This tells the blog to make these pages the first second, third and fourth items in the list. 4. Now to display the pages in the correct order you just need to add your Pages widget to the desired sidebar (Appearance > Widget), change it to Page order and then click Save. Refer to the custom menu support page for more information on working with menu’s or contact Edublogs Support if you need help setting up your custom menu. We are always happy to provide assistance!